I love when I find super easy recipes that taste great. I watched a video by Cooking with Manuela (I do like her videos) the other day and I thought my family may love this. I was right. This breakfast has it all, bacon, eggs, bread, cheese and shallots. 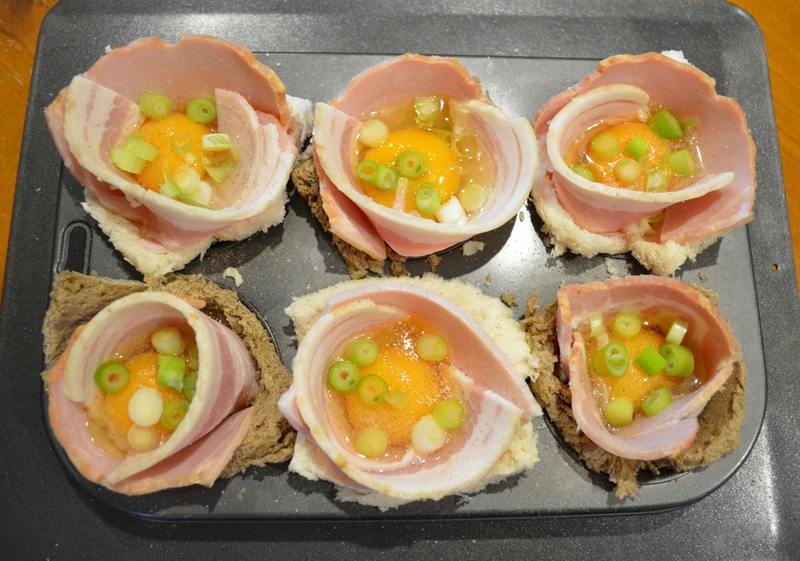 What I also love is there is very little mess, there is no splattering bacon, no egg frying. Very simple, very tasty. I am a person who tries recipes and will never claim they are mine, I think credit must be given to where I got the recipe or idea from. I do however, adjust recipes to suit my families tastebuds. For instance here I added shallots, as we love them. This is how I cook, and you should to, try new things, but adjust to suit you or your family. 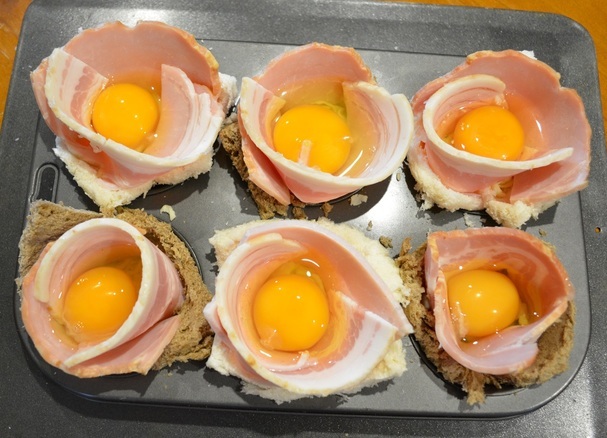 The eggs need to be baked to your liking, 15 minutes, I find too runny, 20 minutes I love, 25 minutes, for me is already too cooked, the yolk is no longer runny. So I advise to start checking the eggs at 15 minutes, then check every 2-3 minutes until you baked them how you like them. Remember every oven is different so cooking times will vary slightly. Here I also tried it with thickly sliced white bread and with a rye bread. We prefer the white bread as it goes crisper, however the rye bread was lovely also, so use whatever bread you like. 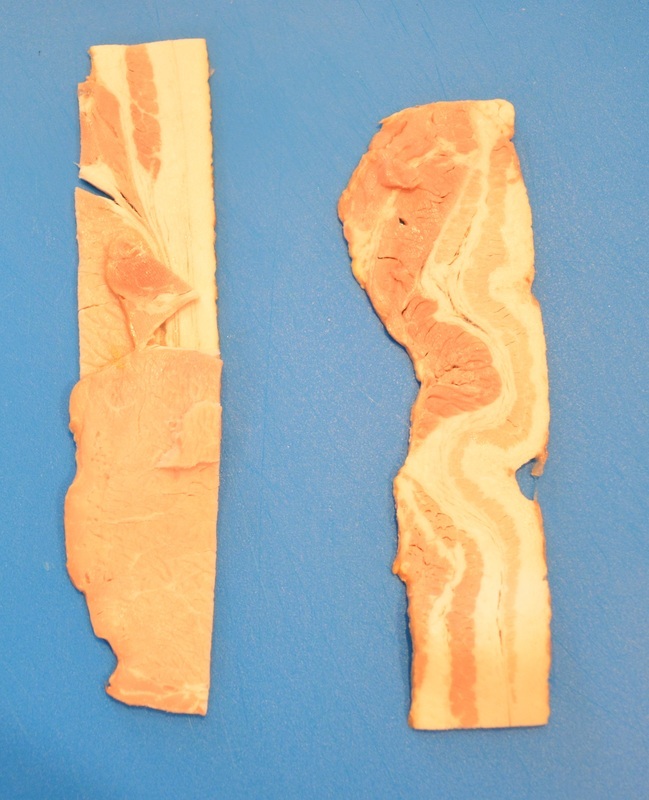 I used bacon as that is what I had in the house, but you can use pancetta, if you prefer. 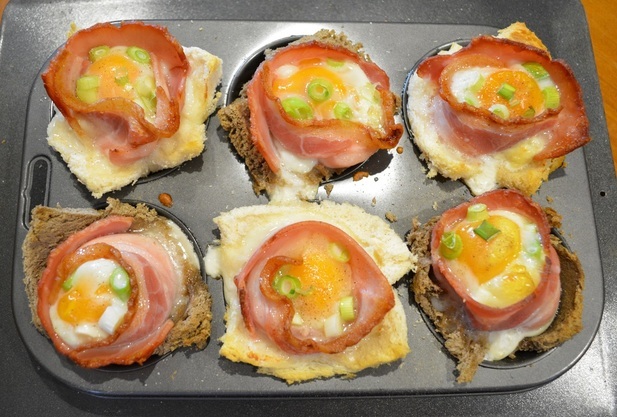 ​The recipe says mozzarella cheese, but use tasty if you prefer or any cheese you love that melts. 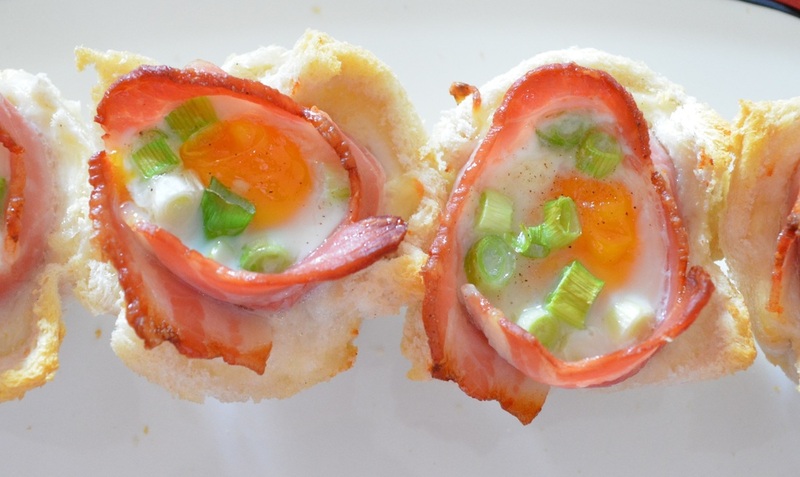 This is one easy breakfast/brunch to prepare. So give it a go, it will not disappoint. Cut all the crusts off of the bread. Then use a rolling pin and roll each slice of bread until flat. 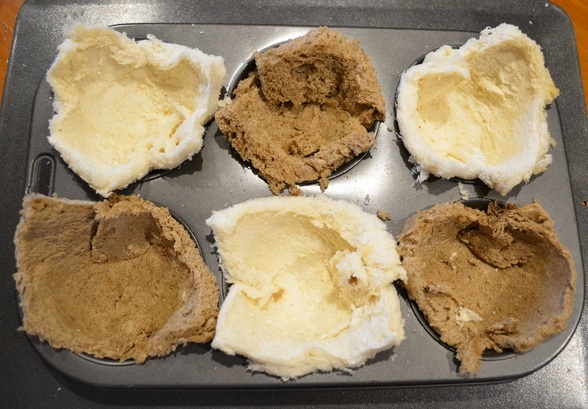 Place the bread carefully into your muffin tins. Try not to tear it. Any lumpy bits, just press to flatten. Sprinkle in some grated mozzarella. 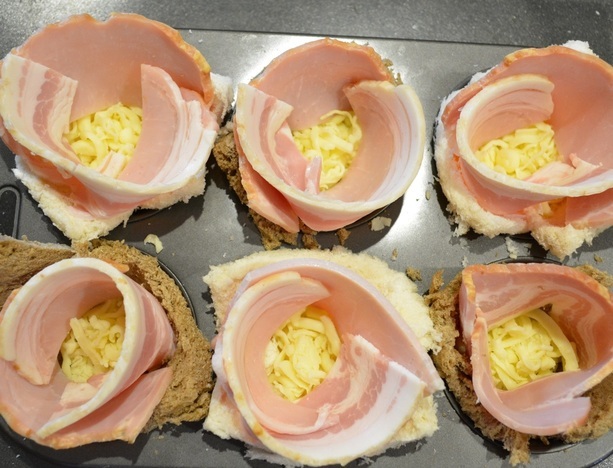 Wrap the prepared bacon (see picture below) inside of the bread, you want it to sit inside the muffin tin but come up above the tin, so it will hold all of the egg. 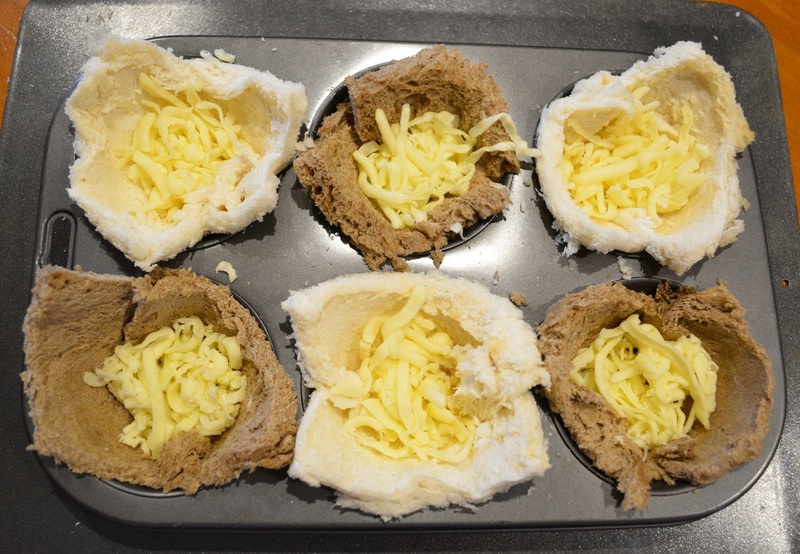 Add one egg into each muffin hole. Season with salt and pepper. Sprinkle with shallots. Bake for 15-25 minutes, or until cooked to your liking. We like it cooked to 15-20 minutes so that the egg yolk is still very runny. 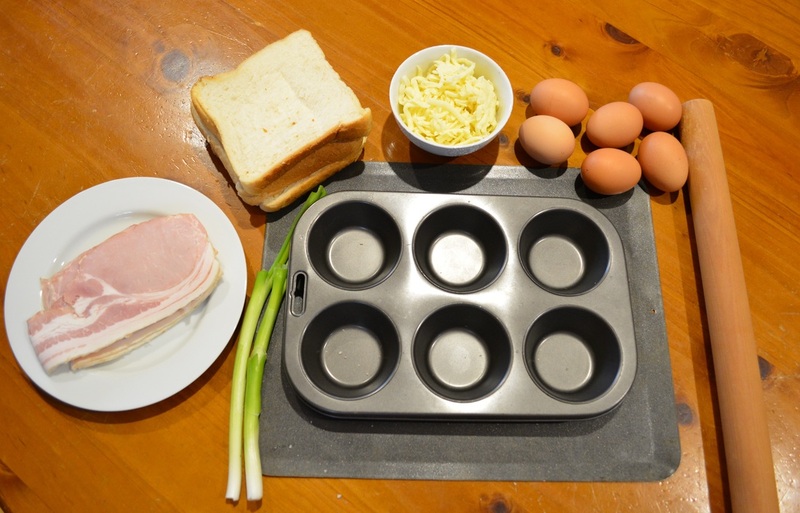 Everyone's oven works differently so start checking from 15 minutes, but bake until the eggs are how you like them.